We are in the midst of the greatest economic upheaval since the industrial revolution. 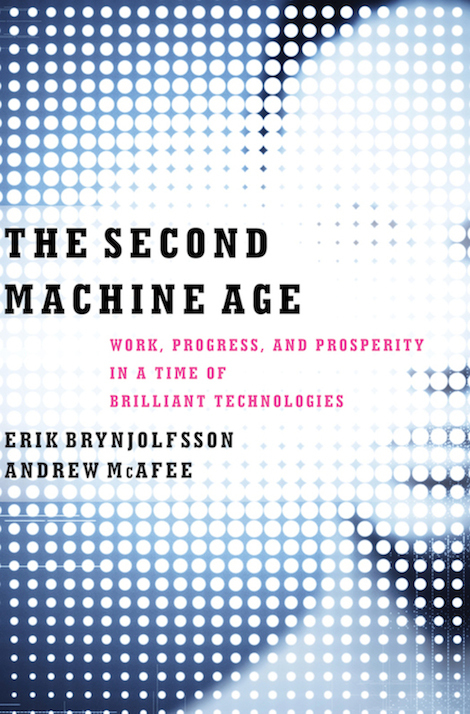 This is the premise of The Second Machine Age by Erik Brynjolfsson and Andrew McAfee, a book discussing the economic implications of present day technological trends. It is an excellent piece, which touches on several topics I have previously explored in this blog, from the trends towards scalability and the consequent ‘winner takes all’ market dynamics, to the deep challenges the information age poses to the measurement of economic growth. for society and one negative. On the one hand technological change is generating an enormous bounty of economic growth. On the other hand, it is also driving increasing spread between rich and poor, and these economic faultlines could undermine the basic fabric of society. Behind both bounty and spread is the rise of machine intelligence. Machines can take on ever more tasks, even ones that a decade ago we thought would be impossible to automate. The poster child for this is driverless cars. Technology experts used to think driving is so complex that humans would always have an advantage over computers, but the exponential progress of technology has rendered this prediction wrong. Google has been testing driverless cars for several years and Tesla’s Autopilot mode has already made automated vehicles a commercial reality. 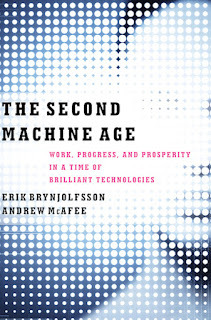 One of the discussions in the book I find most compelling is on the subject of technological unemployment. At least since the days of the Luddites, the spectre of machines taking our jobs has worried generations of workers and commanded much attention in social and political science. The prevailing wisdom in the contemporary economics establishment is that technological unemployment is, indeed, a phantom, one we need not worry too much about. The argument goes as follows: while technological change may tear down old industries, it opens up new possibilities, and through the process of entrepreneurial action old ‘factors of production’ can be redeployed to productive uses. People whose skills become obsolete can learn new skills, they just need to be flexible about the type of work they are willing to do. The argument against technological unemployment rests on the idea that people can adapt and find employment in growth industries. This reasoning holds as long as the rate of adaptation is faster than the rate of technological change. Historically this has been the case: despite the gales of creative destruction blowing strongly, society has adapted. * However, Brynjolfsson and McAfee point out that just because a trend held for 200 years doesn’t mean it holds forever. The rate of technological change has been increasing; can we expect that individuals and the institutions of society will adapt at an ever increasing rate as well? Another part of the argument against technological unemployment is that gains in productivity lead to lower prices, which in turn stimulate a higher volume of consumption. This assumption – that in aggregate the long-run “elasticity of demand” is approximately one – would provide an adjustment mechanism if technology continues to raise productivity. The authors point out that if this assumption is wrong, then economic growth would eventually come grinding to a halt. A corollary of the elasticity of consumption argument, not addressed by the authors, is that it relies on prices going through periods of deflation. Deflation occurred in 1930s US and 1990s Japan, and might have occurred in the 2008-2012 Great Recession if it were not for the unconventional monetary policy of central banks around the world. Avoiding deflation has been celebrated for averting a potentially disastrous depression. But if prices are never allowed to fall, we lose one of the economic mechanisms for adjusting to technological change. I don’t have a clear cut answer to this dilemma, but I would like to see a few more economists discussing this issue. In this hypothetical end-game scenario, the equilibrium wage for human labor falls to zero. Managed well, we’d be in a Utopia, managed poorly – dystopia. Something implicit and horrifying in this last mechanism is that the free market’s solution to an oversupply of workers is starvation. When demand for a typical material good shrinks, its price falls. The supply side of the market adjusts by producing less of it. But when demand for labor shrinks, its price (i.e. the wage rate) may fall, but this doesn’t translate to a lower supply of labor (i.e. a lower population), except through violent means. The book concludes that governments need to take action in order to make the most of technology’s bounty while minimizing the spread, or at least mitigating some of its worst consequences. Amongst other things, the authors advise greater investment in education (“higher teacher salaries and more accountability”), more support for entrepreneurship, more investment in science, and more progressive taxation, especially raising taxes on those with superstar levels of income. The authors join a growing minority of commentators who view a Basic Income – a guaranteed minimum income paid by the government – as the best solution to rising inequality. ** In the long run this might be the only feasible way to organize an economy which only requires a small, skilled minority to generate most of its economic output. Technological change bears the potential to benefit everyone, but it also has the potential impoverish the majority while enriching a few. This is not some science fiction future – this is starting to happen today. The warning bells are sounding and now some wise leadership will be needed to steer the ship through the coming storm. * Though not without spells of pain and suffering along the way.